Indoor gardening is gaining popularity since various folks don’t have outdoor locations to fulfill their gardening hobbies. People who want to protect their plants and vegetables from the extreme cold also prefer grow tents. Grow tents are more flexible and reliable than outdoor growing. 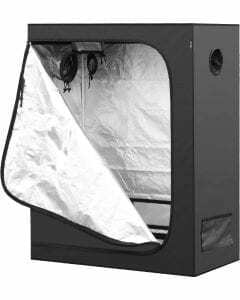 Due to their popularity, there are many grow tent models on the market. This can confuse any buyer, which is why in this article, we are going to help you choose the perfect grow tent for you. In this article, you’ll read the best 4×4 grow tent reviews. As the name suggests, a grow tent is used to grow plants and vegetables, but mostly cannabis. In this case, you use a tent to facilitate your grow room. It is completely portable and has the shape of a tent. The exterior of the tent is made with a hard canvas but the inside of the inside of the tent is made of a reflecting material. 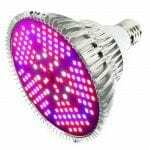 Since, no natural light can penetrate the canvas, grow lights are used. They provide the energy for photosynthesis. The reflecting material inside of the tent works best with these grow lights. It doesn’t let light escape and keeps it inside the tent until the plants absorb the light. Grow tents provide a small indoor planting or gardening area where you can grow your vegetables and plants. This is your grow room. You can do this without worrying about the harsh weather conditions or not having a gardening area. Also, you can optimize the climate and conditions inside the tent. Making it the ideal climate for your plants to flourish and get the highest yields. Grow tents help in growing healthy plants and vegetables without letting the environmental factors affect them. If you have no gardening area or live in harsh weather conditions, gardening can become quite difficult. This is the main reason people like using grow tents. 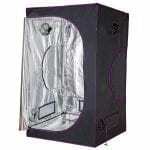 The best indoor grow tent will help you in creating a perfect environment for your plants. You can also grow in stealth modus when using a grow tent. You can regulate everything! A good grow tent is lightproof, so the conditions on the outside of the tent do not affect the plant. Most horticulturists prefer these tents to grow plants in as these tents encourage uniform and healthy growth of the plants. Sensitive plants that are affected by any change in weather conditions are grown very easily in the of a grow tent. Some plants require isolation from the rest of the plants, only then they grow properly. These grow tents are ideal for those plants as well. They protect the plants from environmental conditions and provide the warmth and light that is needed by them. The risk of pests and insects ruining your plants and vegetables is eliminated. The best indoor grow tent is completely light proof, which ensures that the plants get the ideal amount of light. Grow tents are durable and portable which makes setting them up and dismantling them very easy. You get the best value of your plants as they grow uniformly and have the ideal conditions. You can do soil-free gardening. Available in different shapes and sizes that can be used according to your needs and the indoor space you have. It provides a higher yield due to optimal conditions. 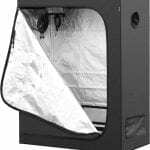 Are you looking for a smaller grow tent? Check out our 3×3 grow tent reviews. We also reviewed 4×8 grow tents. Grow tents come in various shapes and sizes. 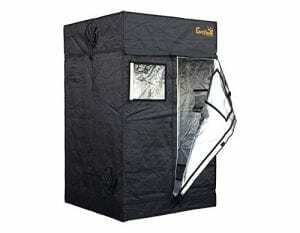 We will review the best 4×4 grow tent for you. This is a common size for many growers who want to keep it simple. 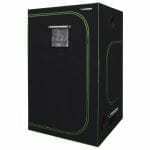 You can easily grow plants in this size grow tent that is not larger than a regular closet. We will tell you everything you need to know about the most popular grow tents in these grow tent reviews. This 4×4 grow tent is manufactured by one of the most trusted brands on the market, Apollo Horticulture. Its height is 80 inches, which give enough room to grow any type of plants. 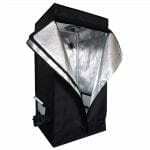 The feature that makes it one of the best 4×4 grow tents is that it uses Mylar. It is used as the reflective material, which is by far the best reflective material and increases the intensity of light. All the materials used in the construction are high-end and durable. The metal poles, the stitching, and the zippers, everything is heavy duty and stays put for a long time. The assembly of the tent requires a little effort. The clear-cut instructions make assembly easy. 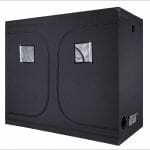 This durable and sturdy hydroponic 4×4 grow tent uses high quality material. It is claimed to be 99 percent light proof. The outer material used is 600D canvas, which makes it very durable and sturdy. The installation process of the tent is very easy as it comes with pre-finished poles. The poles and the connectors used are high quality, which prevents breakages and wearing over time. Usually, the zipper is the area where light can leak, but not in this case with the Vivosun Mylar Hydroponic. This 4×4 grow tent is light proof and has one of the best zippers on the market. It comes with a small window that lets you peek in and witnesses the growth process of your cannabis. The zippers are non-light leaking. The materials used in this hydroponic 4×4 grow tent makes it one of the best grow tents on the market. It has a black wardrobe like look and flaps on top as well. By opening the flaps the user can easily monitor and witness the growth of his/her plants. Even though it is a tall 4×4 grow tent, the high-quality canvas makes it stand tall without the risk of crumbling down. The manufacturers have put in a lot of thought in the design of this grow tent. It not only gives optimal growing conditions, but also convenience to the user. The poles of the grow tent have click locks which make the assembly easy. This grow tent has heavy-duty support bars that can take up 110 pounds of weight. The external material of the tent is a 210D canvas and the internal material is mylar with a reflectance ability of 92 to 97 percent. The zippers used have heavy stitching and multiple layers to keep the light from leaking. The grow tent is manufactured to prevent any kind of odor from accumulating in the tent. It also keeps all the bugs and pests out from the plants. The frame is made with heavy-duty steel, which can take the weight of the hard canvas as well as the hanging plants easily. The manual that comes with the tent is very easy to follow. This grow tent is taller than most of the grow tents on the market. Its height is 6-feet and 7 inches. Despite the fact that the grow tent is taller than most of its competitors, it still has extension kits that can be bought to increase the height of the tent. The fabric of the tent is also three times thicker than the other tents on the market. This makes sure that no light is leaking from the tent. The tent is durable and sturdy. The thickness of the material used is 1680D. There are hardly any grow tents on the market with this kind of fabric density. The flood pool at the bottom of the tent is large enough to contain even a large spill. This grow tent is one of the bestselling 4×4 grow tents on the market. It is efficient, ergonomic as well as economic. Its assembly is fast and easy which has taken the market with a boom. The construction of the grow tent is very simple and basic, and the materials are very high-end and durable. The poles used are a heavy duty, which allows you to hang heavy plants as well. The mylar used inside the tent can reflect 100 percent of the light. It not only saves the electricity but also improves the yield of your plants. The tent is washable inside out which makes cleaning easy. Unlike other grow tents on the market, it comes in two colors. Interested in a complete buyer’s guide for a 4×4 grow tent before you make your choice? Check the video below to learn more on grow tent kits. Grow tents can help you fulfill your gardening dreams even if you live in a condo. It can help you grow organic vegetables and can help you grow the best cannabis plants in perfect conditions. 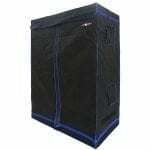 These grow tents can be used to enhance your gardening by turning your plants business up a notch. They are perfect for horticulturists as well. However, the trick is in choosing the right grow tent for yourself. 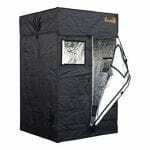 In this article, 6 top 4×4 grow tents have been a reviewed. All of the tents are great, but our favorite is the hydroplanet mylar hydroponic 4×4 grow tent. Its basic design and heavy-duty constructions make it a great tent for every grower. It has no difficult assemblies or other difficult features and it can handle the heavyweight. It is the most efficient tent for your indoor growing environment and keeps 100% of the light in. Read our reviews on the best PAR light meters. We review the 6 best and most popular 4x4 grow tents of 2018.